Drunken Sailor is the latest of a rash of pop ups to grace Cardiff’s ever burgeoning food scene. It comprises of two guys whom I know vaguely from the blogosphere (Grill and Barrel and the Plate Licked Clean) who have taken the brave step from merely writing about food to producing the stuff for the paying public. Braver guys than me! A worthy goal to feed the public, but not without inherent risk. We, the paying public, can be a fickle and demanding lot. 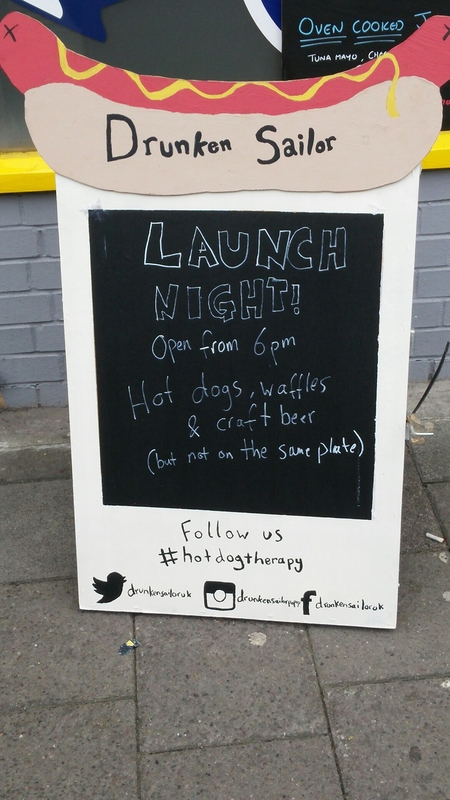 Drunken Sailor (love their logo) are purveyors of fine hot dogs and waffles. I was there for the ‘dogs’ rather than the waffles. 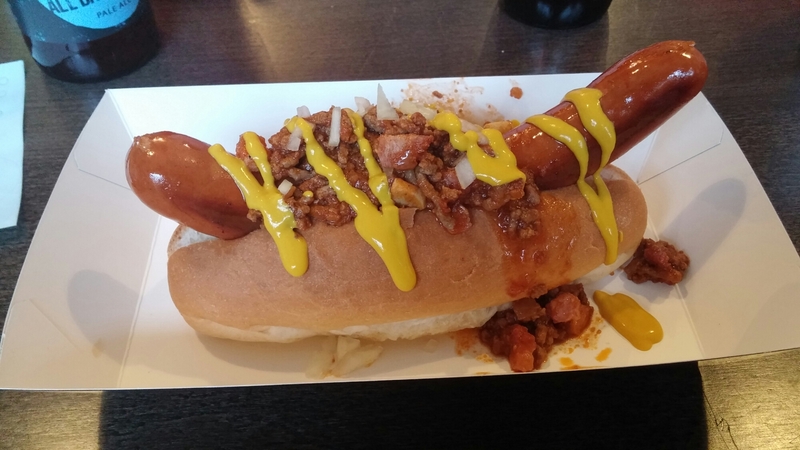 I am a big fan of the ‘dog’, which to me is one of the greats of the fast food world. Easy to eat on the go – no implements just hands and gob required to eat it- and if made properly bleeding delicious. Quality ingredients are the key to a good dog and Drunken Sailor get their dogs from top quality sources, including local food hero producer Charcuterie Ltd.
with a Coney Island (a ground meat based) sauce, raw white onions and some mustard (has to be French’s on a dog – nice to see French’s mustard on table, although I did have to remove the seal from the squeezy bottle on our table after vainly trying to squeeze mustard out of it and worrying how weedy I appeared to have become). 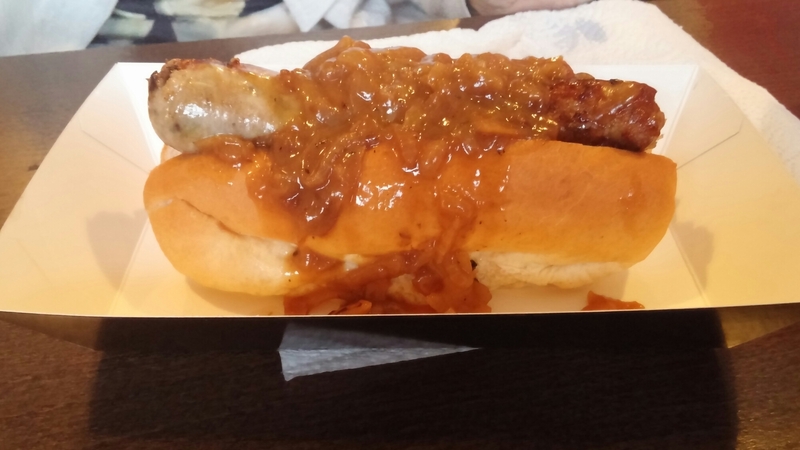 Mrs. SF went for the NYC, an all pork dog (made by a Polish butcher in London for Drunken Sailor) with fried onions and mustard and another of our party went for the Butcher’s Banger (a tradional british banger containing pork, bacon and black pudding, topped with onion gravy). My dog was a mighty fine looking beast. It was cooked well being nice and plump and juicy, with a great snap (dogs have to have a good snap) to it and a really good flavour including a lovely subtle sweet smokiness (as I said earlier you can’t go wrong with Charcuterie Ltd’s products). My only slight criticism was the “Coney Island” sauce perhaps lacked a bit of zip – needed bit more pepper or chilli or garlic (maybe even all three) and maybe something else – splash of hot sauce? went down equally well, with Mrs. SF saying that rather than continuing to make my own “hot links” I should buy these (crushing my fragile ego in the process :)). 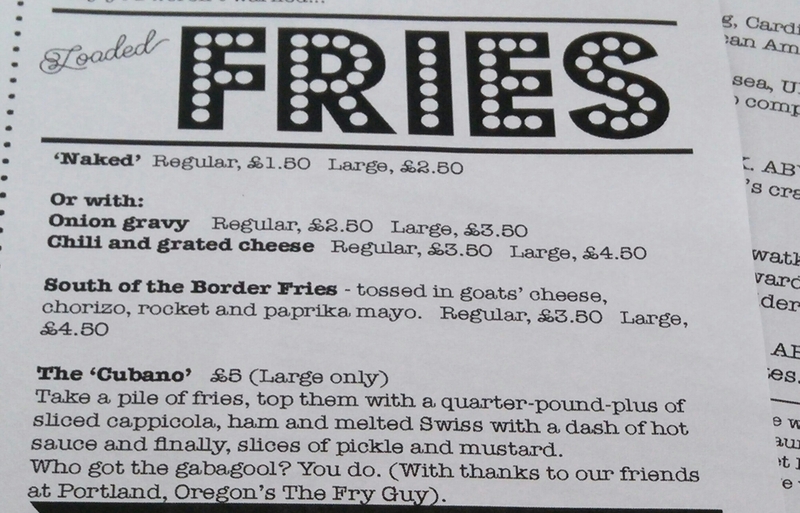 including South of the Border Fries and the very appealing and rather lovely “Cubano” fries (£5.00). Enough for two to share the Cubano Fries comprised crisp piping hot fries on top of which a layer of various hams (including cappicola) and melted swiss cheese had been added. 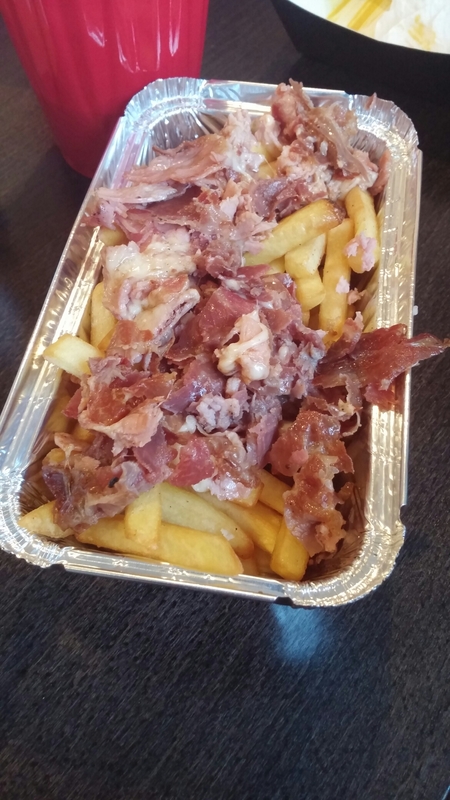 Not a looker, this salty gooey topping was the perfect foil for the fries, making this a great chip dish. Good, really good. 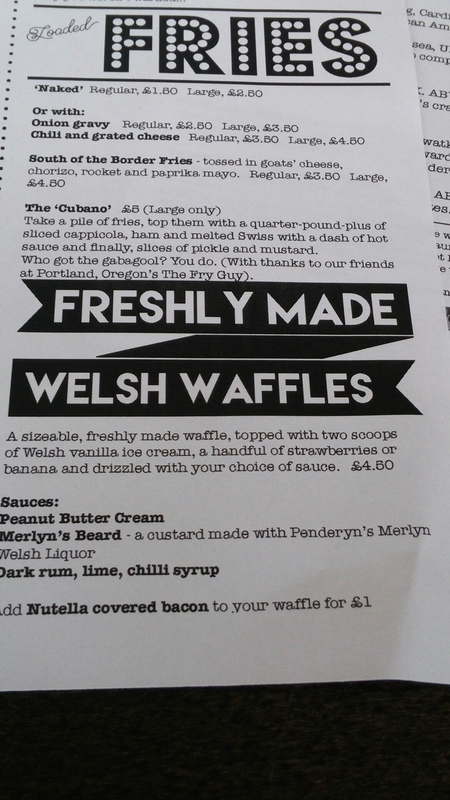 Didn’t try the waffles, but they sounded good on the menu. 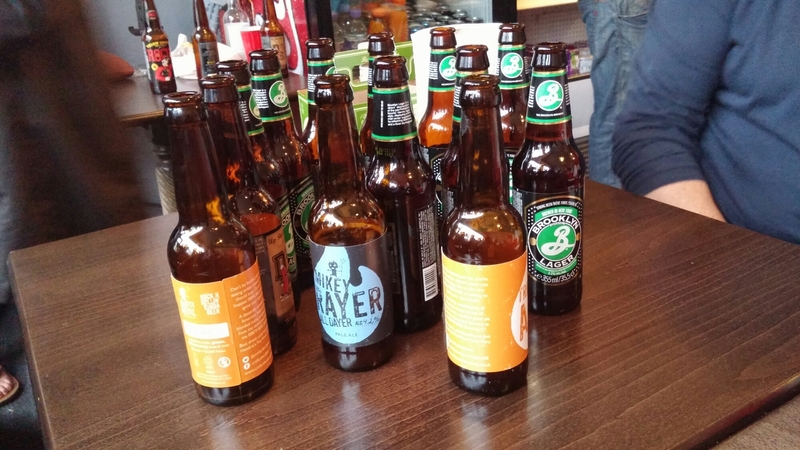 The perfect match drinks wise for top dogs is beer (good beer) and Drunken Sailor had on offer a stellar selection of craft beers (both local and from further afield) and ciders. We tried quite a lot of them whilst we were waiting for our food (was a bit of a wait – but we were warned in advance it would be). 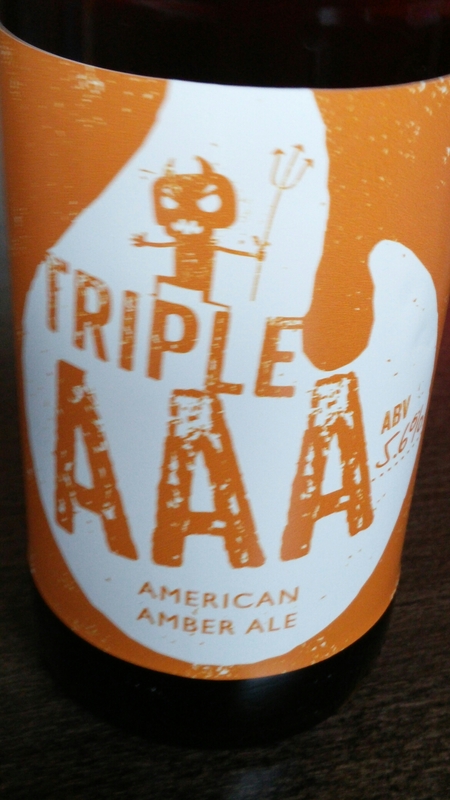 My favourite was the Crafty Devil Brewing co’s Triple AAA – which went down a treat solo and with my dog and Cubano Fries. 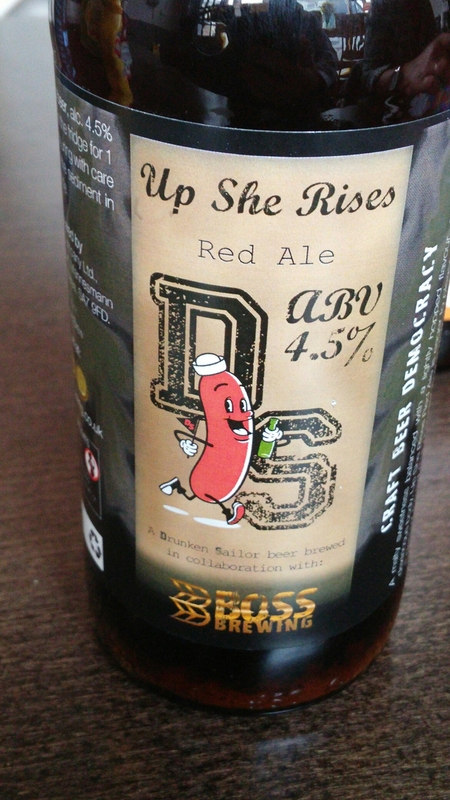 I also enjoyed their ‘house’ beer, “Up she the Rises” (slightly risque name when sat by their sailor sausage logo) made for Drunken Sailor by Swansea brewer Boss Brewing. 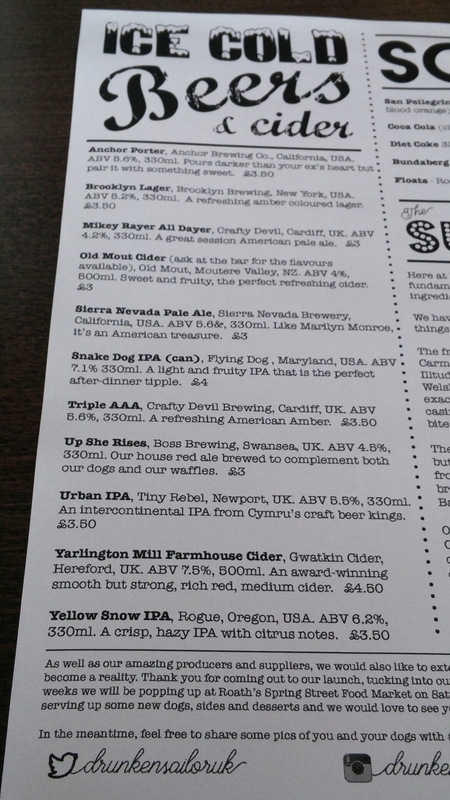 All in all a strong offering from Drunken Sailor, with quality dogs, inventive sides and great beer. There were a few teething problem (when aren’t there with a new venture’s first night) with service slow, but this sort of thing is understandable on a first night and easy to iron out with practice. Would I go back? 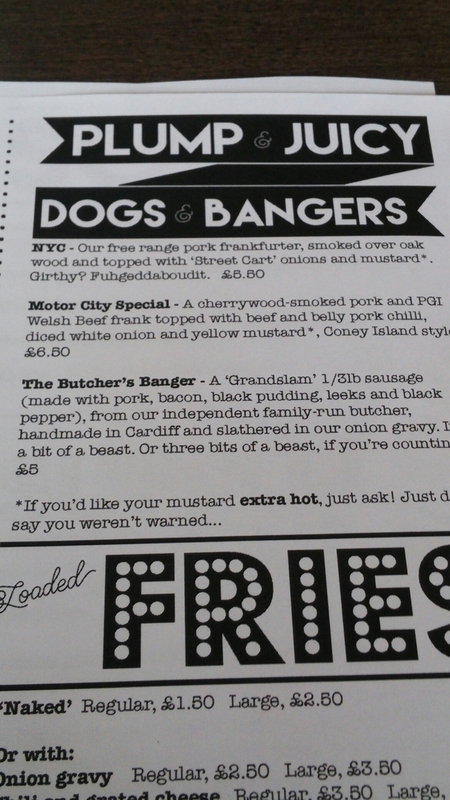 Oh yes I will be looking out for them in future – best dogs I have had by some distance in the UK and just loved those Cubano Fries. You can catch Drunken Sailor next on the bank holiday weekend – the 2nd May – at the Roath Spring Street Food and also at the DEPOT’s next street food extravaganza. 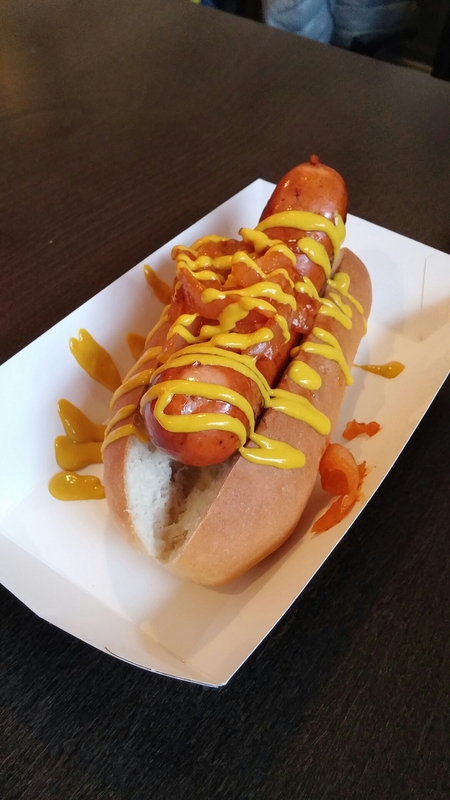 This entry was posted on Apr 26, 2015 by solicitingflavours in Alcoholic drink, American food, Bacon, BBQ, Beer, craft beer, Diner, Drink, Drunken Sailor, Fast food, Food, hot dogs, IPA, New restaurant Cardiff, pop up, Restaurant Review, sausages, Smoker, Wales.